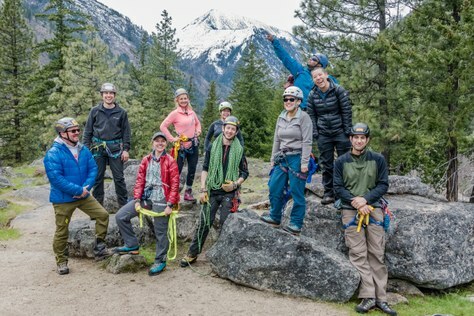 In the 3 months following the completion of our Progressive Climbing Education Strategy, we've hired staff and recruited volunteer committees to start putting things in motion. In mid-2016, The Mountaineers Board of Directors voted to allocate funds to begin a project called Progressive Climbing Education. The goal was to dedicate resources to advance the goals and initiatives of our passionate volunteers. Done well, these strategic investments will make our suite of volunteer-led Climbing Programs more fun for volunteers to run, easier to recruit volunteers for, more attractive to new climbers (especially those coming out of the gym), and more advanced for our highly-skilled volunteers and students. On January 12, 2017, the Board of Directors ratified a multi-year Progressive Climbing Education Plan and approved $131k to fund the first phase of work in 2017. The Progressive Climbing Education strategy will focus investments in four key areas: Leadership Development, Curriculum, Access, and Community. In 2013, the Board approved a new Leadership Development Manager position to provide support to our volunteer leaders. Chris Williams served in that role for three years until he moved on in October of 2016. We saw the Progressive Climbing Education Initiative as an opportunity to redesign the position. With additional funding, we had the opportunity to hire two positions, knowing that a) one person will need to really focus on climbing in order to move this initiative forward, and b) much of what we learn through Progressive Climbing will be applicable to our hiking, kayaking, nordic skiing, and other activities. We are pleased to announce two new Education Managers! Sara Ramsay started on April 17, 2017 as our new Kayak, Hike, and Ski Education Manager. Sara comes to us from across the park at Outdoors for All, where she supported volunteers in a variety of ways. She brings Nordic ski experience having managed the Nordic program and strong relationships within the Northwest PSIA community. She has taken ACA’s “Coastal Kayak Day Trip Leading” course and has guided multi-day sea kayak trips on Lake Superior and in the San Juans. She’s also an avid hiker and backpacker, and has led hiking and backpacking trips in the Grand Canyon, in Colorado and in Washington. In her recent role at Outdoors for All, she worked with key volunteers to completely revamp the volunteer training and onboarding structure, bringing the policies and procedures up to industry standards. We’re excited to have Sara join our team to support the innovation, development and success of our volunteers. Steve Smith is our new Climbing Education Manager and will start on May 22. Steve comes to us with more than 20 years’ experience in the Outdoor Education and Risk Management, bringing a broad spectrum of knowledge from organizations like Outward Bound, NOLS, and the Student Conservation Association. Steve served on the Wilderness Risk Management Conference Committee for seven years, including 3 years as Conference Chair, and sits on the NW Outward Bound Board of Directors. He has built strong relationships with key leaders in the outdoor industry both regionally and nationally. He’s climbed most of the classic Basic Climbs in the Cascades as well as a few Intermediate Climbs, and has experience ice climbing in Colorado and Canada. He also served on the Climbing Education Advisory Council during the discovery phase of the Progressive Climbing Education initiative. In his role, he will be working with our climbing committees to provide support and to drive our Progressive Climbing Education initiative forward. He’ll work directly with the Climbing Technical Advisory Committee, the Climbing Curriculum Committee, the Climbing Leadership Progression Design Group, and the Climbing Summits. He’ll also serve as a liaison to the American Alpine Club and other member organizations of the Alpine 5. Steve will also work with our Scramble, Snowshoe, Backcountry Ski and Avalanche folks to provide support through summits and as needed. He’ll work closely with Sara Ramsay, our Kayak, Hike & Ski Education Manager, on organization-wide leadership events like the Leadership Conference and the Volunteer Appreciation Dinner. We’re very excited to welcome Steve to our team! This past year, we engaged in a pilot initiative with E-Learning - turning the Wilderness Navigation Seminar into an E-Learning experience. Students reported a great experience and instructors reported that E-Learning students were significantly better prepared for the field trip than were students who attended the in-person seminar. We see a lot of opportunity to create E-Learning lectures to complement many of our climbing courses as well as train-the-trainer seminars. We've had encouraging conversations with industry partners who are interested in collaborating on some online learning projects. In the meantime, we’ve posted the E-Learning Course Developer position. Thanks to the great work on the e-learning navigation pilot, we have a good vision for ways this person can add efficiency, consistency, and overall value to our courses. Nevertheless, this is still new territory for us, and we anticipate this position will evolve as we learn more about the world of e-learning and how it can play into outdoor education. Initially, the E-Learning Course Developer will curate existing material and work with the Climbing Education Manager and our volunteers to create small-segment modules that can be combined a la carte to a variety of courses. Our early goals are to use e-learning as a way to support the Curriculum Committee, the Leadership Progression Design Group and the Technical Advisory Committee. While full time staff are needed to support Progressive Climbing Education, this is truly a project that needs to be driven by volunteers, true to our organizational character. We've identified four key committees that will help address key issues in Leadership Development, Curriculum, and Access. View the full committee descriptions and complete an interest form to participate. Technical Advisory Committee - We are convening volunteers from all branch climbing committees to make annual recommendations for climbing techniques to be used organization-wide. This committee will be charged with keeping abreast of new technical and gear developments as well as industry standards, recommending changes to committees, and implementing a training plan to ensure any changes are adopted by all branches. Currently we have volunteers from Seattle, Tacoma, Olympia and Everett branches, and would love to have a volunteer from Kitsap and Bellingham on this committee. Leadership Progression Design Group - We are bringing together volunteers from each branch's climbing committees to re-design our leadership progression. Currently, it's a cumbersome bureaucratic process to become a Climb Leader, and each branch has slightly different definitions and varieties of Climb Leader. We also have lots of less-technical activities run by highly-qualified climb leaders because we don't have entry-level leadership designations. The Leadership Progression Design Group will be tasked with developing a leadership growth process that is easy to understand, consistent across branches, and helps students become leaders early and progress in status. They'll help design recruitment and training for long-term volunteer engagement. Currently we have volunteers from the Olympia and Everett Branches. We need representation from at least four of the branches (but preferably all 6 that have climbing programs) in order to get going. Curriculum Committee - We will bring together volunteers from all branch's climbing committees to inventory our current courses and curriculum, standardize curriculum across branches, and then work to expand course offerings, including short-course modules to meet the needs of busy climbers. We currently have volunteers from Olympia, Seattle and Everett branches for this committee. We would love representation from Tacoma, Kitsap and Bellingham as well! Climbing Access & Stewardship Committee - We will bring together volunteers from each branch's climbing committee to address our access issues and promote stewardship of our climbing areas. This committee will be charged with scouting, identifying and developing new climbing areas (including urban educational facilities), partnering with local agencies to conduct stewardship projects, making recommendations to our climbing committees about party size reduction where needed, and participating in advocacy efforts to promote access to public lands. Currently we have representatives from Seattle, Everett, Bellingham and Kitsap on this committee, and are looking for representatives from Olympia and Tacoma. Once Steve is on board, we'll begin working on a strategy for Leadership Development opportunities. We'll be working with regional and national partners to provide high-quality training for our volunteers at all levels. Professionals for Leader Training - A pretty unanimous concern among climbers in The Mountaineers is the lack of train-the-trainer opportunities. Our instructors have great technical skills, but don't have much or any formal training in teaching or leadership skills. We will invest in professionals to lead these types of trainings. Professionals to Lead Advanced Courses - At some point our highly skilled volunteers run out of personal skill building opportunities at The Mountaineers. All that's left to do is volunteer. We want to continue to build our volunteers' skills both to keep them fresh and to make it rewarding to remain a part of The Mountaineers. We will invest in professionals to teach high-level courses such as Water Ice Climbing and Aid & Big Wall seminars. Questions about Progressive Climbing Education? Contact Becca Polglase, Education Director, at beccap@mountaineers.org. Photo: Mike Hendrickson's Everett Branch Basic Climbing group enjoying a fun Rock 2 field trip in Leavenworth. Photo by Kara Hollenbeck.